Procurement organizations today are under significant pressure to cut costs while simplifying and speeding up the procurement process. Sourcing, vendor management, purchasing, and contingent workforce management are cumbersome and require signatures from personnel who are often out of the office and difficult to track down. View this OnDemand webinar and learn how DocuSign streamlines this process, enables remote approval on mobile devices, lowers costs, and improves the experience for requesters, approvers, and vendors alike. From admission and discharge to billing and record keeping, today’s hospitals use technology along every point of the care continuum. But challenges remain, especially when so many clinicians and staff access patient records across multiple points, and often on different equipment. Health IT leaders must safeguard patient data not only on desktop computers, but on hand-held devices, remote monitoring equipment, patient and physician portals, and more. Covered California – the state of California’s official healthcare marketplace – helps ensure individuals, families and small businesses can find low-cost health insurance. But paper-based processes previously made it harder for the organization to quickly and efficiently provide coverage to citizens who needed it. So Covered California implemented a digital agent enrollment process to streamline internal administration and offer customers a higher level of service. Industry experts predict that all successful businesses will soon become 100% digital. The biggest challenge is the “how”. The HR world is rapidly changing; candidates and employees are becoming more tech-savvy and expect to engage with HR digitally, instead of with paper. Now more than ever, HR teams need to think about how to put best practices in place to facilitate digital relationships with employees, candidates and talent. Going digital in HR will help your organization attract and retain the right talent and enrich the overall employee experience. According to Salesforce.com, 70% of sales opportunities are closed and lost. Improving productivity of sales teams requires consideration of a host of tactics: processes, talent management, and compensation are just a few. One of the most effective ways to bring these and other factors together is to encourage sales reps to think of themselves as the CEO of their territories. With DocuSign & Google, you can create, edit, and complete documents in minutes right from Google Drive and Gmail. DocuSign has been designed as a natural extension to core Google applications, enabling users to create end-to-end digital workflows and move seamlessly from an email attachment or file stored in Drive to approval & signature in no time at all. Doing business has never been more efficient. Plus, your clients and partners will love the ease and convenience of signing with DocuSign. With DocuSign & Google, growing your business is simpler than ever! With DocuSign & Google, you can create, edit, and complete documents in minutes right from Google Drive and Gmail. DocuSign has been designed as a natural extension to core Google applications, enabling users to create end-to-end digital workflows and move seamlessly from an email attachment or file stored in Drive to approval & signature in no time at all. Doing business has never been more efficient. Plus, your clients and partners will love the ease and convenience of signing with DocuSign. Find out how Austin Fraser, a leading recruiting firm in the UK, uses DocuSign + Google across their organization. You already know the power of Salesforce to close sales fast. But did you know you can multiply that power by adding DocuSign? The two products are seamlessly integrated, so you can use DocuSign to compress the entire sales cycle. Watch this on-demand webinar to get tips and tricks to streamline your sales process and help you generate revenue faster. Clinical trial enrollment and site initiation is often hindered by cumbersome onboarding paperwork, delaying clinical research and R&D investments. The good news? Cedars-Sinai's Research Manager, Jenny Lester, and Associate Director, Therica Miller have solved the issue by going digital, leading to accelerated processes and greater compliance with regulations like 21 CFR Part 11. Smart sales organizations capitalize on every available opportunities to improve sales talent management. One often under recognized contributor is sales operations. Sales ops departments contribute mightily to salesperson effectiveness, job satisfaction, and sense of engagement. Watch this webinar, "Sales Operations' Impact on Sales Talent Management," to learn how sales ops can help maintain and retain top sales talent in an organization through better training, coaching, and processes. You will also hear how DocuSign helps internal sales teams onboard faster. Forget the war for talent, with the right know-how it’s always possible to find the right people. What you’re really fighting for now is attention. Do you deserve it? Does your company? - See how technology can open the door to your company and how it impacts hiring. - See real examples and discover simple (and free) changes that improve your social recruiting efforts immediately. - Discover how easily you can use employee-generated content to attract great people. Every business has documents that require signatures in order to be executed. For many companies, this remains a manual process that takes place either via email or on paper. But there is a better way. Watch this webinar to hear from DocuSign and M-Files on how integrating information management and digital signature technology ensures a faster and more convenient process for signing agreements. Watch this on-demand webinar with DocuSign and Xconomy to learn about the latest research on alternative financial models for drug development. You will also learn how you can speed up contract and approval cycles by using an eSignature solution for everything ranging from clinical trials to distribution when bringing new products to market. In this webinar, we examine a series of these ideas, presented by a practitioner panel. Topics discussed include how to identify improvement opportunities, approaches for testing and evaluating new tools, and other practices focused on improving sales process. There are massive changes happening in talent management that require companies to implement talent acceleration strategies. These changes create a great impact on staffing and people processes, but also create risks for business capability and continuity. This webinar will give you a firm grounding in what you need to know and how your company or organization can respond to the new agile marketplace. - The four big problems most companies face. - Three tactical strategies to implement now. - Defining the talent acceleration challenge. - The value of talent acceleration: effective metrics to quantify business & people impact. Watch this webinar to hear from Nancy Nardin, founder at Smart Selling Tools, Valerie Kuklenski, Senior Legal Contracts Manager at BlackLine, and Ryan Vandersloot, Account Executive at DocuSign, on how sales organizations are shortening their sales cycles and increasing ROI by reducing paper waste and going completely digital with DocuSign’s eSignature solution. Sign up now to hear more about DocuSign’s seamless eSignature solution and how DocuSign can help shorten the sales cycle and help close more deals. Industry experts predict that all successful businesses will soon become 100% digital. The biggest challenge is the “how”. The HR world is rapidly changing; global candidates are becoming more tech-savvy and rely on mobile-enabled interactions. Now more than ever, HR teams are looking to attract and retain the right talent, increase employee satisfaction, and enrich the overall recruiting and onboarding experience. Here’s the time to make 2017 a year of digitization and transformation. The plan: revamp all of your current HR processes and swap paper for an eSignature solution for everything ranging from offer letters, new hire approvals, candidate NDAs, and contractor agreements. Nearly 50% of business leaders fear they will become obsolete over the next several years, and nearly 80% feel threatened by digital startups. Why? New technologies and digital strategies are challenging existing business models and forcing companies of all sizes to reimagine patient care, product innovation and distribution models to remain competitive. View this on-demand webinar hosted by PharmaVOICE to learn from Andrea Bradbury, Co-Founder and Chief Quality Officer, Suvoda Software, a leader operating at the intersection of life sciences and technology as she shares how she built her business on a digital platform to accelerate her organization’s global expansion while meeting the needs of mobile, digital customers and employees. With DocuSign & Google, you can create, edit, and complete documents in minutes right from Google Drive and GMail. DocuSign has been designed as a natural extension to core G Suite applications, enabling users to create end-to-end digital workflows and move seamlessly from an email attachment or file stored in Drive to approval & signature in no time at all. Doing business has never been more efficient. Plus, your clients and partners will love the ease and convenience of signing with DocuSign. - With DocuSign & Google, things just come together! In April 2016, the Department of Labor (DOL) released its final rule regarding financial and fiduciary disclosures. This rule significantly expands the definition of fiduciary, spanning financial advisors as well as plan sponsors, funds, and producers who provide incentives to advisors. The rule has far-reaching impacts on business, compliance, and operations/technology and the April 2017 compliance deadline is coming up quickly. For companies not already working on their response strategy, time is rapidly running out. According to a PWC study, “two in five customers leave banks after a bad experience”. And 45% of these will discourage others from using their former bank which makes a great customer experience a crucial competitive advantage. Customers are switching to banks that allow them to interact digitally at the branch and on the go. These new Digital Banks will lead the way, deliver excellent customer experience, and thrive in this digital decade. 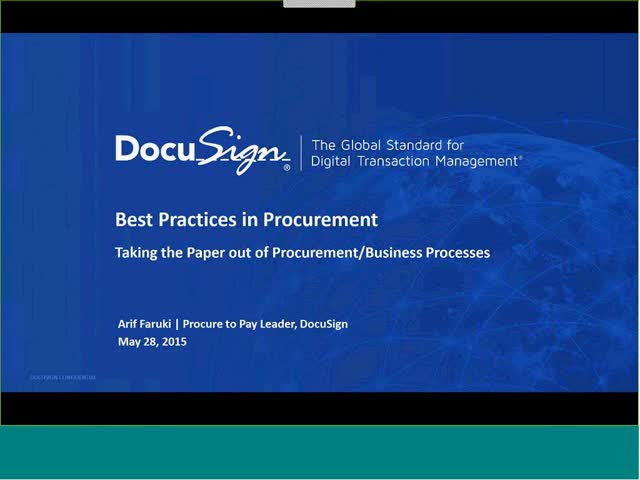 Find out how DocuSign can you help you eliminate paper from your processes and join the digital age. From account openings to servicing and new product sales – DocuSign helps keep the process digital so you can focus on what matters most: the customer. - Provide a great customer experience!